Olympus is the banner under which Stefan Neville (Pumice) and Kraus (ex-Futurians, The Aesthetics) clang and pound in collaboration. The duo built their reputations on unique one-man-band visions of mutant pop songforms, crafted with modified & manipulated instrumentation. Together as Olympus, Neville and Kraus have managed to step outside their comfort zones without sacrificing any signature moves. Recorded and assembled over the past few years by exchanging tapes in the mail, Bold Mould surfs along a warbled, technicolor path lined with basement kraut grooves, blasted tape manipulation, fuzzed-out homemade electronics, explosive drumming, minimal synth dervishes and melancholy pop instrumentals. 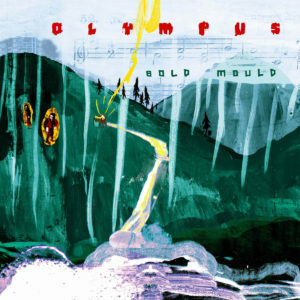 Olypmus’ playful experimentation, deluge of ideas & cracked sense of humor aligns Bold Mould with such like-minded spins as Oddities (The Clean), A Trip to Marineville (Swell Maps), On the Way to the Peak of Normal (Holger Czukay) and Deceit (This Heat). 3. Is Love an Emotion?